It is very important to have a great vocalist for your song demo. Professional demo singers know how to sell a song and it’s idea for a great first impression. 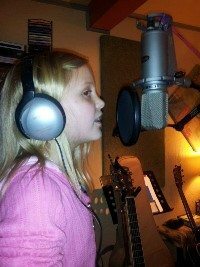 Our demo vocalist have been in the business for many years and fully understand the process of recording, working with lyrics, harmony and right emotion to draw the audience in when pitching your song. Any one of our demo singers below can work to greatly improve your chances of getting your song heard and recorded. Important terms and conditions with respect to copyright and use of a singers vocals. Session Singers are work for hire through Backwoods Recording Studio. Vocals can only be used as a demo for pitching purposes and not as a song for sale on iTunes or any other music outlet without written permission. The Session Singer nor Backwoods Recording Studio will take any royalties regarding your song and you have all rights for all your own material that is recorded at our studio. Add any one of our Demo Singers to a Demo Package. Simply add it to the cart. Kalii is a fantastic singer who has a real knack for bringing emotion and life to your song like no other. She has a soft quality to her voice that is unique to any other and has also been compared to powerhouse vocalists like Carrie Underwood and Miranda Lambert. Kelly is a singer, songwriter and has always been referred to as "the other Wynonna". She is one of our client's favorite. Once you hear her you'll know why. Kelly's vocals are powerful and she puts her own touch on every song. Lydia is a seasoned studio vocalist who focuses on tone, pitch and emotional delivery of your song. Her versatile soulful voice works equally well on contemporary country or folk songs, as well as those leaning more towards pop genre. Thorne Avery has a smooth, rich, unique sound and a special talent for bringing out the most in a traditional or modern country song. As a songwriter himself his passion is to make your song the best it can be! Get Thorne to sing your song demo and bring it to life! Tony Ray is a songwriter, producer and owner of Backwoods Recording Studio. He's a gifted artists who's opened for many legendary country music artist like Willie Nelson, Ed Bruce, Dan Seals, Sawyer Brown and other greats. You choose 1 of our Demo Singers above to sing to your track. This includes the main vocal and 2 harmony parts if needed. We record the vocals to your track. Any lyrics changes after the recording will be $50.00 per hour minimum to re-record the new vocals. Important terms and conditions with respect of copyright and use of a singers vocals. Session Singers are work for hire through Backwoods Studio and vocals can only be used as a demo for pitching purposes and not as a song for sale on iTunes or any other music outlet without permission. Session Singers nor Backwoods Recording Studio will take any royalties regarding your song, you have all rights for all your own material that is done at our studio.